thanks for the clarification. I have a question about the tax stamp that appears on most of the cards that were cut up for this tableau. I know, I think from Wicked Pack, that taxes on card were abolished by the revolutionary government. So does the presence of the stamp mean for sure that the cards were made for sale before that date? I think they are library stamps, not tax stamps? "Thierry Depaulis owns forty cards from the first edition of the Grand Etteilla Tarot - In the margins of the Eigth of Batons, where Etteilla had advertised himself, d'Odoucet has obliterated the engraving and has used a pen to insert his own name and address"
I wonder how Depaulis 40 cards compares to these Basan samples? Good question. Here is the same card in Depaulis's pack, pictured in Wicked Pack. It seems the same, except that Depaulis's pack was sold after Etteilla's death, when D'Odoucet appropriated all Etteilla's stock. If the stamp that appears on the cards of the "temple of fire" layout is a library's, then I would guess that the lack of a tax stamp doesn't mean much.. The ones on the sheet may not have been printed originally as cards, but just in the form we have them. Or, like Depaulis's, they were from a printing done after the tax stamp requirement was removed. 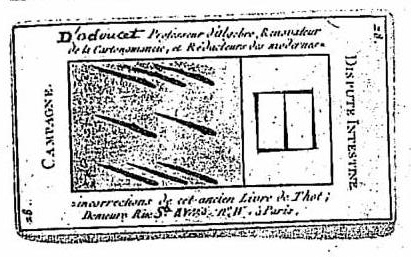 The "Temple of Fire: layout also includes, besides the diagram of 1787, the engraving that was the frontispice of Cours Theorique et Pratique, 1790. Again, the engraving may have preceded the book publication. On tax stamps, you are right. Looking in Kaplan vol. 2 I see that France didn't put stamps on cards until 1890, according to Kaplan. They were taxed, but not stamped, by the methods you indicate. Sorry to have introduced this confusion. All this time I've been thinking those little red ovals on French card reproductions were tax stamps, when they're actually library stamps! It is a confusion (since later there are tax stamps) I must have acquired early on and then never questioned. Thanks for straightening me out. In this copy, which is far from complete, card 28 has a caption half-scratched out: instead of Etteilla's name, we read the name of his successor D'Odoucet (with all Etteilla's usual titles! ); the address has been changed, in pen, to D'Odoucet's address (i.e. 'rue St. Anne, no. 11, a Paris'), ... Card 9 has A. P. D. R. ("Avec privilege du roi', with the King's appointment) printed on the side, a usual caption which disappeared in 1791. ... Since the rue St. Anne was changed to 'rue Helvetique' from 1793 to 1814, this copy would date back to 1792 (see plates 2-3). That is to say, I think, that the card as altered in pen dates from 1792. The deck itself, prior to mutilation, must have been printed sometime between 5 February 1789, when Etteilla was granted the 'privilege' (p. 92) and whenever in 1791 the king came to have no 'privilege' to grant. But why, for the altered copy, 1792 and not earlier? Well, on p. 99 we read that Etteilla died 12 December 1791, after which, as Wicked Pack cites Etteilla's biographer Millet-Saint-Pierre citing a letter of 5 March 1792 by an Etteilla disciple named de Bonrecueille, that (p. 101) D'Odoucet "had seized hold of Etteilla's filing box and 'regardless of the deceased's intentions claims also to be the correspondent-general, a title which he actually does not deserve in any respect.'" Later (p. 104) they refer to this seizure as "of his stock". Hence the cards' change of sponsorship. I don't see anything about who got the plates. They do say (p. 105) that D'Odoucet was a printer himself, who from 1797 and 1808 was in prison many times for violation of the press laws, he being a royalist. As far as the "Temple of Fire" being in a 1783 book, it is possible that it is in the 3rd Cahier, which was printed that year. It discussed all of the cards. But Corodil, who had a copy - microfilm or microfiche, I'm not sure - said nothing about it when he posted the French text, and there is nothing referring to it there, I'm pretty sure., even in a veiled way. 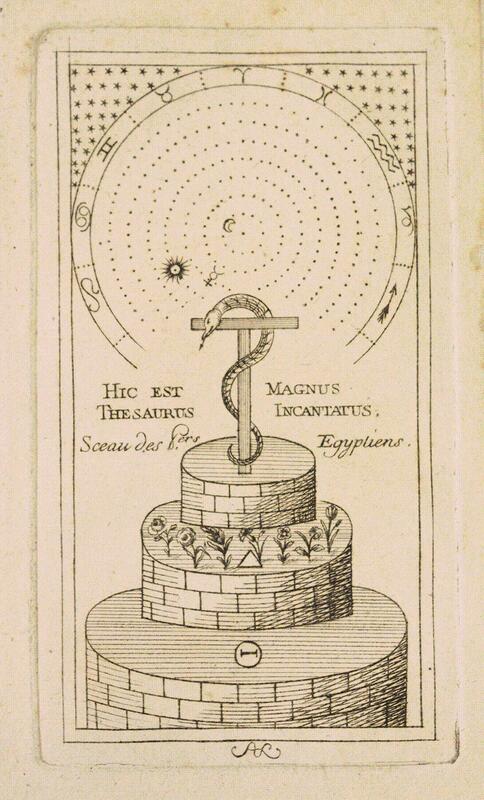 He does discuss some of the symbols in the 1787 Lecons to which the diagram is the Frontispiece, and there is more of an explanation, somewhat veiled, in an article by Hugand of 1789 (see my blog-essay at http://templeinmemphis.blogspot.com/). I am dubious about the precision of Westcott's note. although I am not 1035 Euros curious to see if I am right. But if anyone gets it, or has it, I'd certainly like a pdf of the first 3 essays. 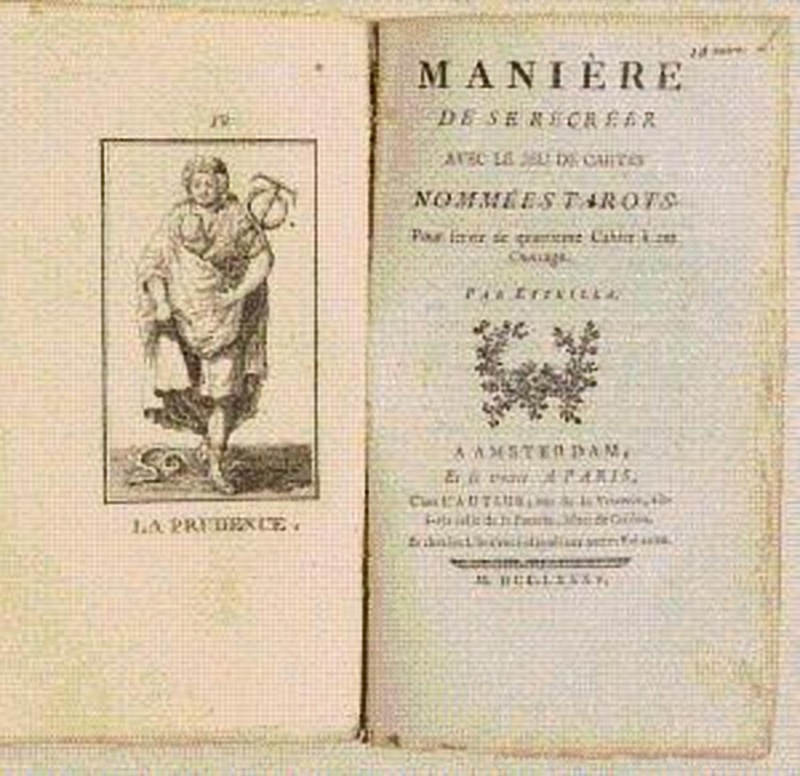 If you click on the left-hand small image below the two pages featured, you will see the date on the title page of the first essay, the 3rd Cahier, as 1783. We can't see the title page of the next essay, Fragment sur les hautes sciences. Wicked Pack (p. 84) says it was published in 1785. We do have a view of the essay "Jeu des tarots", no date listed.. 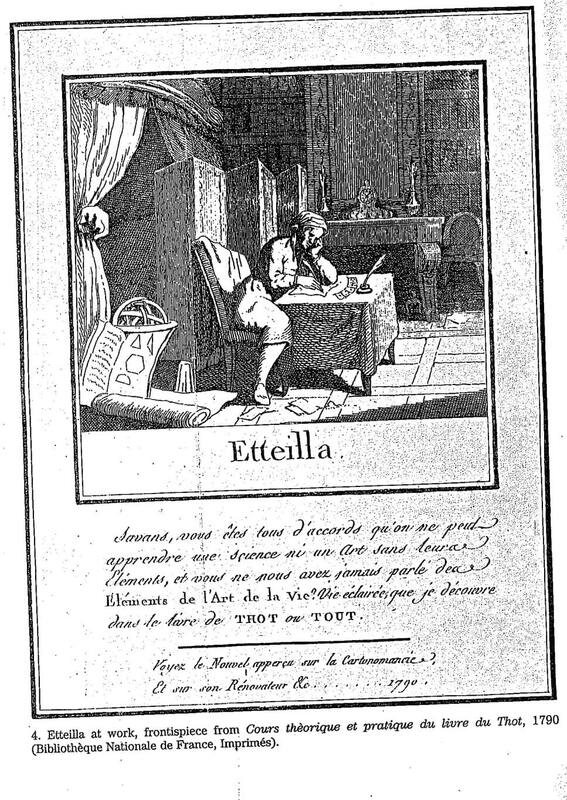 The title page for the last essay, the 4th Cahier, is shown as 1785. Notice that the "date d'edition" in Abe Books' description in small print below Etteilla's name is given as 1783 - a stretch, given that the Fragment and 4th Cahier weren't published until 1785. 1783 is only the date of the first essay. Probably Westcott made the same error. Given that the first essay is a reprint, or at least a rebinding, and probably the second one as well (written in Nov. 1784, Wicked Pack, p. 84, says, so published some months before the 4th Cahier). and since in reprinting or rebinding they also leave the original title page, with its date of publication unchanged, we have no idea when this particular collection of essays was actually printed. 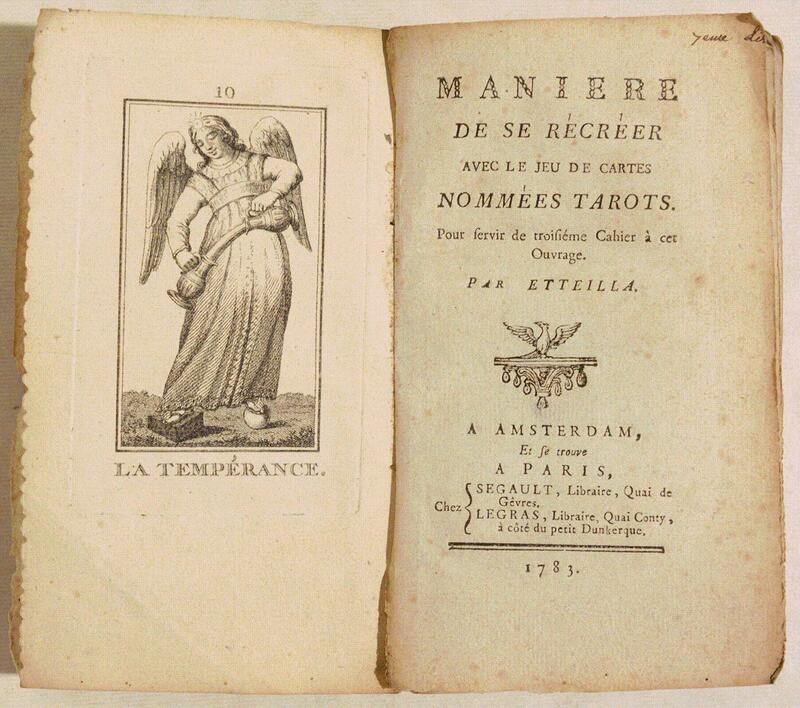 I see that the British Library, for "Jeu des tarots", gives 1788 as the date of publication. (https://www.worldcat.org/title/jeu-des- ... ef_results). How they got that is not clear, but it seems reasonable enough. There is no question mark after the date,to suggest uncertainty. They do put a question mark after their suggestion that Etteilla is the author, also reasonable. They dutifully list the place of publication as "Memphis", but suggest Paris as another possibility. Not only that, but at the bottom of the WorldCat page we have another author, Hermes Trismegistus -- presumably not in Paris. Another WorldCat listing is for a microfilm edition of the book, derived from the copy at Chantilly (https://www.worldcat.org/title/jeu-des- ... ef_results). For date of publication it has "1785?". Also reasonable. It suggests Amsterdam as the real place of publication, with no question mark. and in particular "Chez Mad. veuve Lesclapart", who I'd guess was not in Amsterdam personally. It is 12 pages long. Since the online picture of the title page of "Jeu des tarots" says "a Memphis" on it (as reported), perhaps it has the temple- engraving, too, if not in its original, then in its reprint or rebinding. Or it was added to the 3rd Cahier, which does deal with all 78 of the cards. It is indeed not totally clear that this essay is actually by Etteilla, since his name does not appear on the title page. There is "by the same author", referring to a book on how to read French cards, 3rd edition, which likely is Etteilla. Wicked Pack mentions such a 3rd edition of his first book, published 1783. The only Etteilla-related publication I have scans of that fits the description of dream-interpretation is the "Songes Expliques et Representes par 74 figures" published in 1809 Lille by Blocquel and Castiaux. It has Etteilla's images plus a bunch from oracle decks. 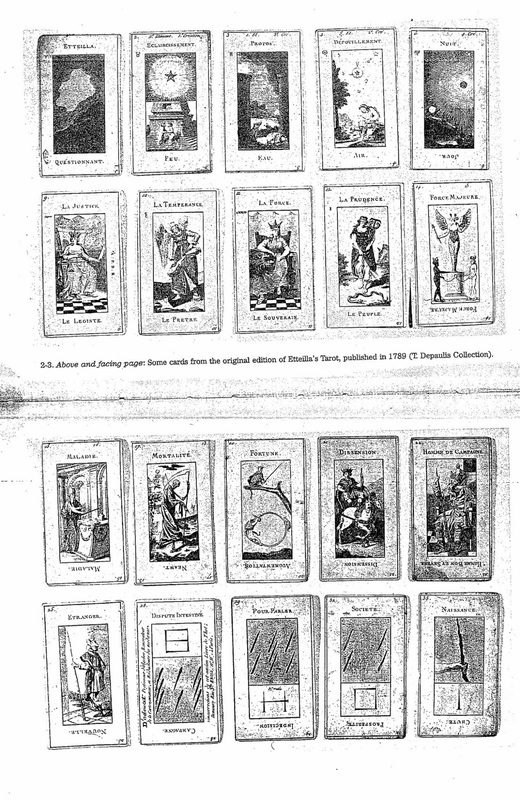 It seems very much derivative from other things; perhaps that "jeu des tarots" is one of them, via d'Odoucet, who was in house-arrest in that city from 1804 until the last mention of him in 1808, when his arrest was ordered due to absence longer than approved (Wicked Pack p. 108). is much longer than 12 pages, more like 126 plus 42 pages with images, some double and some single; but the pages are booklet sized. There is no explicit reference to tarot. 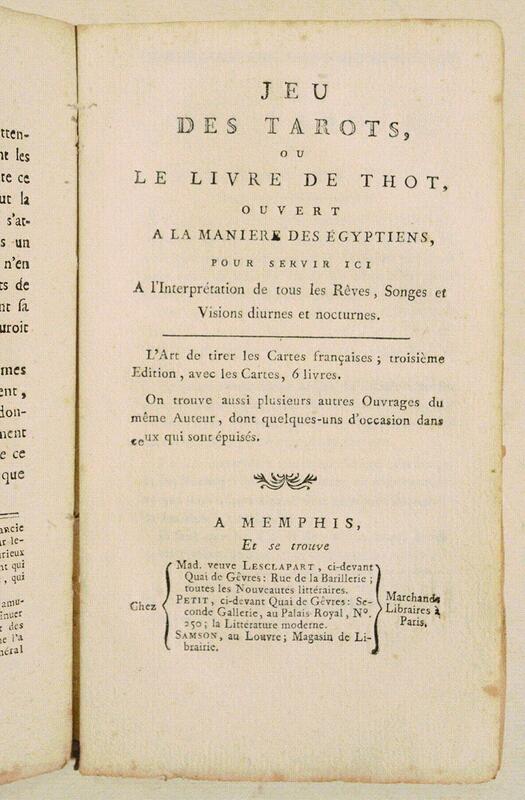 The introductory explication is 12 pages, however, with plenty of reference to the "livre de Thot" as all-important, and very much in Etteilla's style. Added next day: I have corrected the information about D'Odoucet in Lille: he didn't make trips to Lille; he was sent there by the police on house-arrest. I also have added links to the three title pages that Abe Books has images of, in case the Abe Books page should one day disappear. Abe Books has two other images, one of an engraving on one of the pages and the other of the book itself, showing how thick and worn it is. If, holding in your hands the Book of Thoth, price £ 6 [underlined], you don't understand me, take six lessons for £ 3 each from myself or my pupil, M. D'Odoucet, or else buy the book on Tarots (2 bound volumes, 1200 pages with many figures, price £ 12). The volume pictured does look 600 pages long. It is probably one of the 2 volumes. So the book Westcott is referring to was produced sometime between 1785 and 1789. 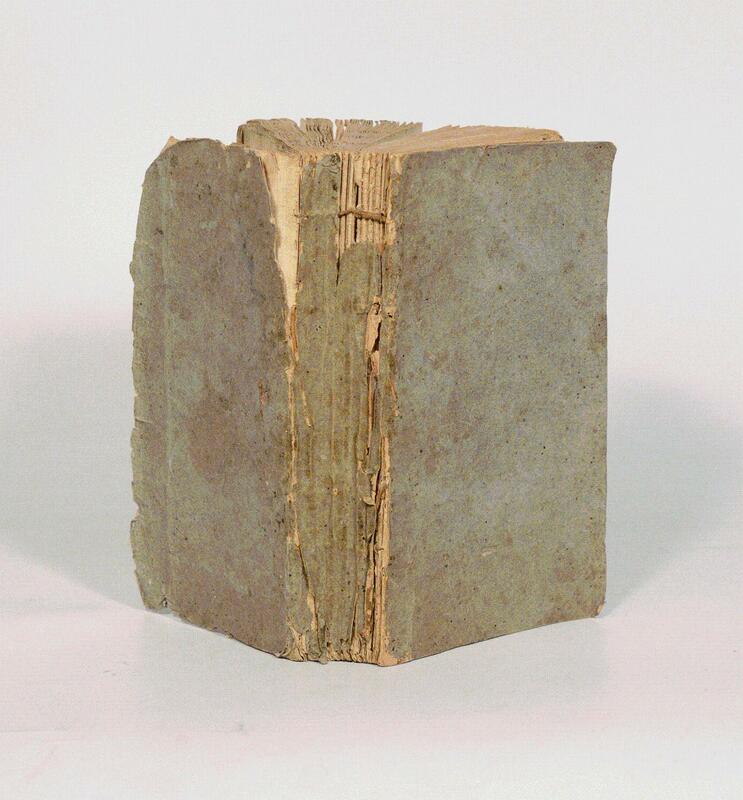 Given that the other volume probably contains, besides Cahiers 1 and 2, such things as the Lecons and other things published in 1787, as well as the supplements to 1 and 2 (that to the 2nd Cahier was published 1786, per Wicked Pack, p. 84)), I would guess 1788 as the most probable.